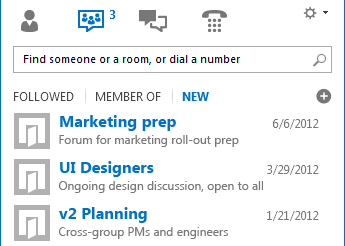 Lync offers a clean new look to help you communicate quickly and easily. You’ll also notice new features like persistent chat rooms, shared notes, and mobility that help you adapt Lync to your own personal workflow whether you’re in the office, at home, or on the go. 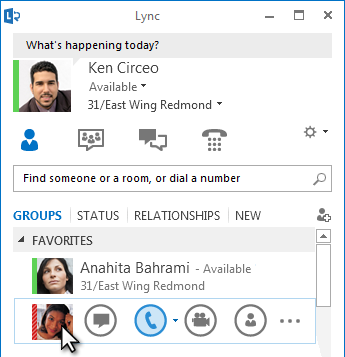 Read on to learn about the new Quick Lync menu, the Favorites group, tabbed conversations, video features, meeting controls, and much more. 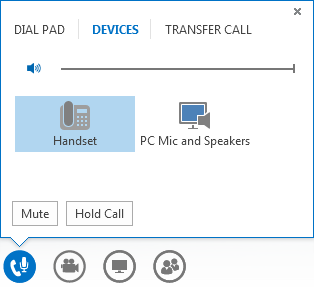 Lync uses a Quick Lync menu to provide more functionality with less clutter. 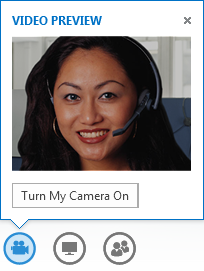 The Quick Lync menu contains buttons that are revealed when you hover over a contact’s picture. You can start a chat, a call, a video call, or view a contact card with a single click. Hover over the three dots on the right side to see more options. Persistent Chat Rooms replace Activity Feeds. With the Chat Rooms button, you can quickly access your chat rooms and topic feeds. 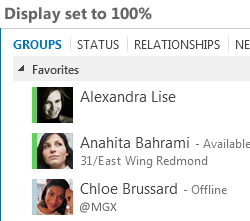 A new Full Screen icon lets you expand your Lync window to fill the screen. The Add a contact button helps you quickly build your Contact list. 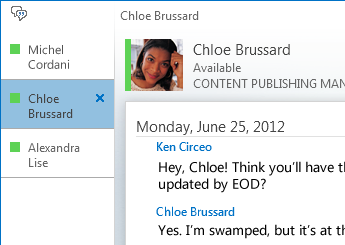 Lync includes persistent chat rooms where you can hold ongoing discussions with the friends and co-workers you choose. Click the Chat Rooms button to search for chat rooms, monitor chat room activity, and read and post messages. Open, which anyone can find, read, or post messages in. No membership is required. Secret, which can be seen by members only. Once you enter a chat room, the pictures at the top show you its members and their current presence status. You can also view any member’s contact card by hovering over their picture and clicking the down arrow. You can even create topic feeds so you’ll be notified if someone in one of your chat rooms adds a post containing specific words. In the Persistent Chat options page, you can set notification alerts and sounds that apply when people post messages to your chat rooms. 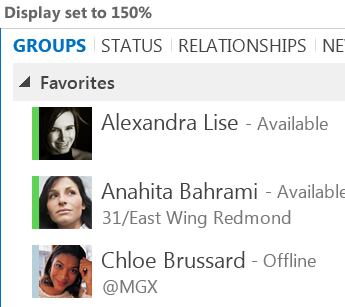 For quicker access, a new Favorites group lets you build a list of people you contact most often. Just right-click a contact, and then click Add to Favorites in the drop-down list. Click Groups to see your contacts and chat rooms organized by the groups you’ve defined. 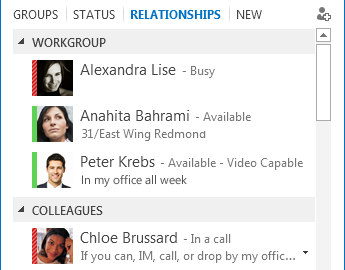 Click Status to see your contacts organized by availability (online, away, unavailable, or unknown). Click Relationships to see them grouped according to the privacy relationships you’ve defined for them, or click New to see a list of people who’ve asked to be included on your Contact list. Use the new Contact List options page to set up how you want to sort and display contacts. You can select an expanded, two-line view that shows contacts’ pictures, or a condensed one-line view. You can also sort contacts alphabetically or by availability. With the new tabbed conversations feature, you can now keep all your calls, instant messages (IM), and chat rooms in one conversation window. The tabs along the left side of the conversation window let you navigate easily among all active conversations. (Of course, if you prefer one window per conversation, you can select that option on the Contact List options page. Use the pop-out button to break out a single conversation into its own window, and then resize it as you like. Then use the pop-in button to add the window back to the main conversation window. You can also use this pop-out/pop-in feature in a meeting where video or content is being presented. Lync can remember your conversation state even when you sign out and sign back in. 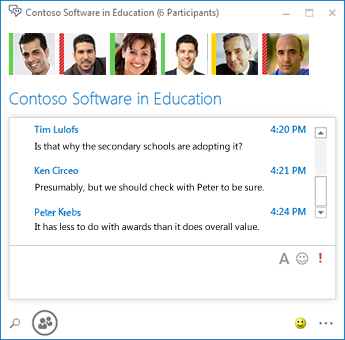 The icons at the bottom of the conversation window let you quickly add others to an IM conversation or upgrade it to an audio call, a video call, or a presentation with file-sharing and web conferencing tools (whiteboard, meeting notes, shared notebooks, and attachments). Hovering over an icon will reveal its communication mode and the options available to you; clicking the icon converts your IM to that mode. 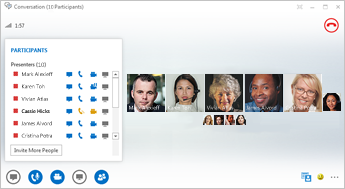 With the Quick Lync menu, you can start a video call with a contact with just one click. Before you place or accept a video call, you can see a preview of your own video in the invitation. With the new Gallery View, you automatically see everyone in the video conference. When video is not available, a speaker’s picture will appear. The gallery controls enable you to see participants’ names and identify active speakers. The gallery shows the most relevant people in the meeting at all times by bringing the dominant speaker’s video “into focus” to the standing row, and displaying the pictures of less active participants in the sitting rows. When there are more than five participants in a video conference, the five most active participants’ video windows appear in the top row, and pictures of the other participants appear below. You can also select one or more of the participants to be visible at all times. Lync provides high DPI support, enabling you to scale text and graphics for 125% and 150% dots per inch. 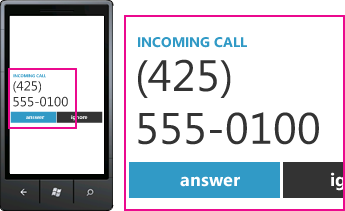 High-contrast support means that Lync is visually appealing, even when used with the different high contrast themes of Windows. Additionally, Lync offers more than 100 keyboard shortcuts for important functions, giving you direct access without a mouse. For example, you can now press ALT+C to accept a call, or ALT + I to ignore it, without even having to tab or set the focus. 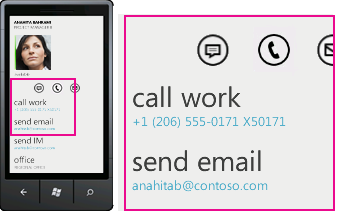 You can also use your keyboard to end a call (ALT+Q), start OneNote (CTRL+N), and open the Tools menu (ALT+T). Extensive screen reader support in Lync ensures that all notifications, incoming requests, and instant messages are read aloud so you’re always kept in the loop. Whether you’re in your office or on the road, you can join a Lync Meeting with only a single click or touch. You no longer need to write down or remember dial-in numbers and passcodes. 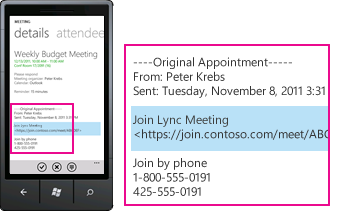 Just click Join Lync Meeting from an Outlook meeting reminder on your computer, or from the calendar or meeting pane on a Windows Phone, iOS, or Android device. When scheduling a meeting, you can select your own dedicated space, or you can create a new meeting room with a new ID and password. This lets you customize your meeting options to better fit your requirements, meeting type, or the participants. For example, if you have external participants, specific presenters, or confidential information to discuss, you might want to create a more controlled meeting space. Depending on the type of meeting, you can now decide whether you want to mute the audience and allow or block video sharing when scheduling the meeting. These options are available on the Meeting Options page and are recommended when you have a meeting with more than 20 participants. Easy-to-use audio controls in the meeting room let you mute and unmute yourself, change your audio devices, and even transfer seamlessly to another number. The Present menu gives you access to all presentable content in one place, such as Desktop, PowerPoint presentations, Poll, Whiteboard, and OneNote. You’re notified every time you share content, with an easy-to-view pop-up in the meeting. You can even select multiple programs to share if you need to work with more than one program. You can now upload presentations that contain video clips. Just upload the PowerPoint presentation and point the mouse over the slide to unhide the video controls to play, pause, or adjust the audio. While another participant is presenting a PowerPoint deck, you can review the slides privately, go back to the presenter’s view, or take over the presentation if you need to co-present. As the presenter of the meeting, you can allow or block sending videos. No Attendee Video lets you restrict video sharing to presenters only. This option is helpful when you have a large meeting and need to limit access to presenters only. Hide peoples’ names under their picture or video in the gallery by using Hide Names. Click Everyone an Attendee to instantly change all other presenters to attendees. Depending on your meeting type, you can select a specific view of content, presenter, or meeting participants by using the Pick a layout button . Gallery View shows all the participants’ pictures or videos. Speaker View shows the meeting content with the presenter’s video or picture in the lower-right corner of the meeting window. Presentation View shows only the meeting content. You get a full view of the content, but you won’t see the participants. Compact View shows only the participants’ pictures. Just hover over a picture to see their contact information. When you record a meeting, the recording is automatically saved in a format (MP4) that plays in Windows Media Player. You can post the recording to a shared location for others to view. OneNote provides new ways to collaborate during a meeting. You can use shared notebooks and co-edit with meeting participants in real time during a meeting, or take notes for your personal use after the meeting. OneNote Share simplifies communication and follow-up while reducing errors caused by later transcription. All team members can access the shared notes to contribute information, brainstorm ideas, or use the notebook pages as a virtual whiteboard. 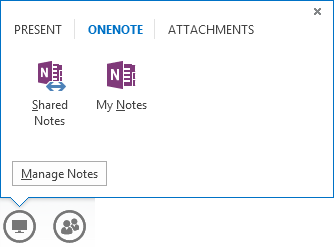 The OneNote window is automatically docked to the meeting window, and people and content shared in the meeting are automatically added to Notes. You can use the Manage Presentable Content menu to change permissions, rename, or remove content. 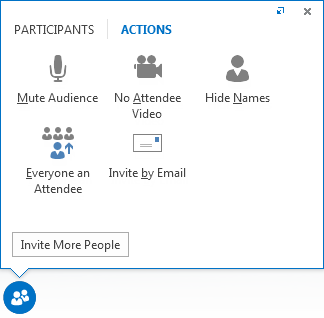 When Lync detects that you’re giving a presentation, it automatically assigns you a Do Not Disturb - Presenting presence status. This blocks IMs and other disruptive communications from appearing. HD video, which brings life and expression to Lync, letting people “see what you mean” in new ways. Voice over IP (VoIP) so you can connect to your meeting from anywhere without getting hit with call origination fees. Instant messaging, which ensures that you can communicate silently when necessary, such as when you’re in a coffee shop or on a train. Desktop, application, and PowerPoint sharing so your content can be seen by other meeting participants, enabling you to continue collaborating without missing a beat! Lync makes it easy for you to communicate anywhere you have Internet or cellular access, by allowing you to be reached by name wherever you are. You can switch among devices as you choose, and be confident that you’ll have a familiar and consistent user experience across computer, phone, browser, and tablet. Lync for mobile clients enables you to maintain your presence wherever you are through your Windows Phone,iPhone, iPad,or Android device. You can manage your time better by deciding your availability and controlling interruptions. You can email, IM, call, or even join an audio conference with just one touch. 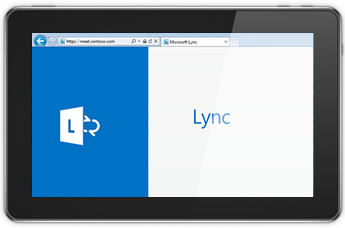 Lync for mobile clients gives you the best productivity across devices. You can view your colleagues’ presence in real time and choose the best way to connect – IM, email, or call. When you call, Lync uses your Enterprise Voice number so you can communicate with a single, consistent identity and avoid call origination charges. Connectivity is available both on your corporate network and on your mobile carrier data channel without requiring a virtual private network (VPN). You can join an audio conference with a single touch, without having to remember passcodes or PINs. 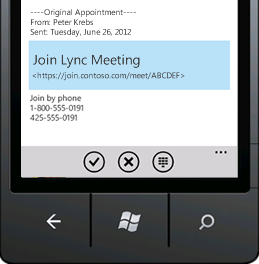 Lync for mobile clients also lets you search your corporate directory and connect to federated contacts on other networks.